Here’s a very cool picture of young children cooling off on a hot summer day. 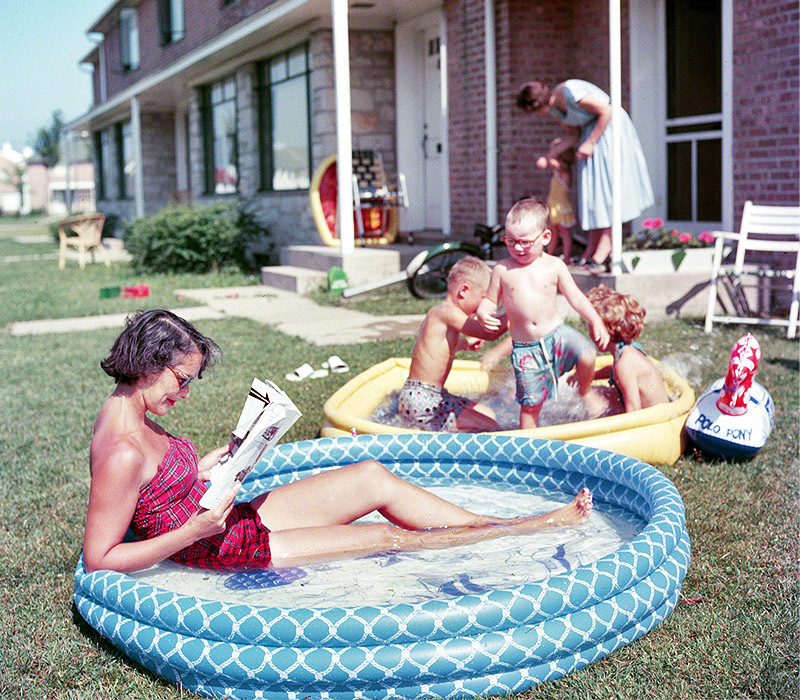 As you can see, above ground pools have come along way since this picture was taken in the 1950’s . The 21st century pools listed below are examples of hi-tech materials and modern filtration systems that create a long lasting swimming pool that will provide clean healthy fun at a bargain price. Best of all these pool will last 20 years or more in the tough Florida climate. Check out our pool Best above ground pool picks for 2018. If your in the market for a saltwater warrantied pool or just an excellent freshwater pool that’ll stand up to the tough Florida climate, the Caspian is for you. This one is basically the best of the best, contemporary styling with solid resin construction everywhere. This model is probably one than we install the most and everyone loves it’s look. It also has the stainless steel wall panel to prevent rust out. Beware of other dealer using the name Caspian to sell lower grade swimming pools. This pool model is perfect for anyone needing a pool for teen aged swimmers or large younger families. Kids tend to be hard on the equipment by nature so a pool like Montego is your best defense. This pool is very durable with thick walls, wide frame rails and broad thick steel top ledges, this model can take a lickin’. 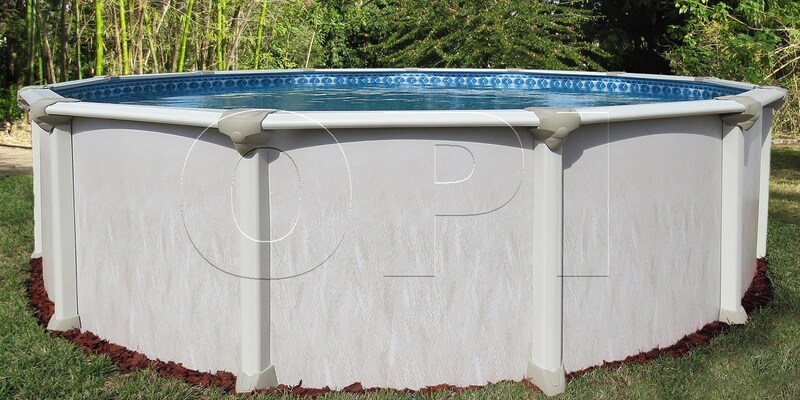 This pool is a very popular model due to it’s sturdy reputation, nice looks and great price. Montego feels so much heavier duty than the standard entry level pool steel pools and it’s an easy pool to assemble. If you are in the market for a smooth sided oval without the side braces sticking out, this is by far the best deal out there. Aside from just giving our picks we want to help you determine what’s best for you, your family and your budget. In a market of hundreds of pool models there are only a few things to consider to quickly narrow down the field. Factors like yard space, pool size, budget and desired features all come into play, so we’ll take them on one at a time. By the end of this page you’ll have a good idea exactly what’s best for you. Yard Space – This is probably the most important factor in determining the right pool as you can’t install a pool that doesn’t fit, even if it meets all the other criteria. The best we to figure this out is to measure your yard and look at your plot plan or know the utility easements for your property. So confirming the amount of space you have to work within is step one. Be sure to account for other features like trees, swing-sets or other obstacles that may need to be removed first. Pool Size – When calculating the available space you have to install your pool you must consider the additional space the pool requires for installation. The advertised pool size is roughly the width or length of the actual water and not the pool framework. On round pools you will need an additional 1′ of space all the way around the pool. Example: 24′ Round pool requires 26′ of total ground space for proper installation. On oval pools things are a little different as they require more space for installation than round pools do. On ovals you should factor in an additional 3′ of space along each straight side of the pool and 1′ clearance on the round ends. This is needed because the oval pools framework extends out further away from the pool along the sides. All oval pools need additional space along the sides regardless of what you may read or hear. Example: 15’x30′ Oval pool will need 21’x32′ of space for installation. Pool Features – This one has several angles to address. There are numerous feature to the above ground pool, wall height, construction materials, framework design etc. The all mean something and all contribute to the total cost of the pool. I’ll expand on each further a little and explain what they mean and which are better. Let’s start with wall height, most pools today are 52″ or 54″. 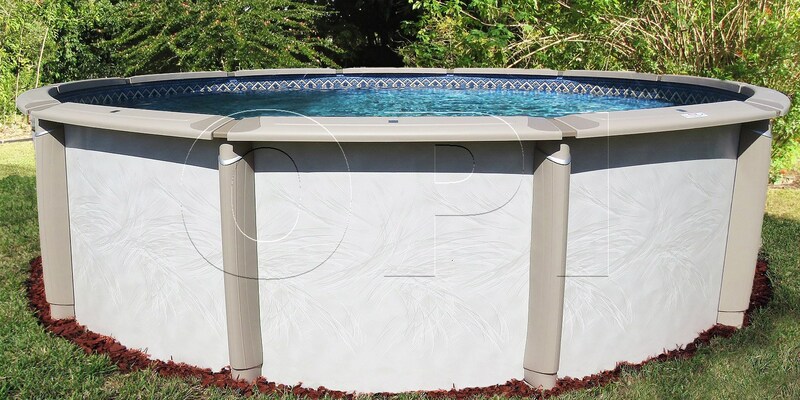 There is not a whole lot of difference other than a couple more inches of water depth between the two, although most fancier pools come with the extra 2″ of wall height. There is also wall construction material, most pools are made from sheet steel while others can be sheet aluminum, aluminum slats, wood or a combination of materials. A steel wall pool is the most common and much stronger and last longer than sheet aluminum pools. This is especially true if the pool is sunk into the earth part way as the aluminum wall corrodes faster than steel and is not nearly as rigid. Good quality American steel wall pools typically last in Orlando about 20+ years. Steel wall pools with the stainless steel service panel last even longer due to the stainless steel used around the skimmer and outlet openings that prevent rust taking hold. Chinese or imported steel pools average about 8 years. The wood pools like on the one on our home page are made of pressure treated lumber much like that of boat docks. These solid wooden pools are made tough lasting 15-20 years and look great doing it. Everyone loves the look and feel of real wood pools and wish they had one. There’s no drawbacks to the wooden pool other than price. Expect to pay double that of a high end resin pool. Top ledge material may be the one feature that makes the biggest difference in looks, now and 10 years down the road. Resin top ledges out perform steel ledges in every category except cost. They are the piece that takes the brunt of abuse from humans as well as mother nature. The advantage of resin top ledges are several, they don’t ever rust, they don’t dent and they don’t get nearly as hot as steel top ledges. Parts made from resin look better and last longer than steel ones. Many other parts of the pool can be made from resin as too, like frame rails, connector plates, stabilizer bars and upright posts. Ultimately the more resin parts that make up the pool structure, the higher the price. Saltwater Pools – Because pool manufacturer’s believe saltwater to be more corrosive than chlorinated pool water they have come out with above ground pools that are warrantied for use with a pool saltwater system. Saltwater swimming pools are simply pools in which nearly all components are made using resin instead of steel. Seeing how resin or plastic parts can rust, they make a great material to build non-structurally important pool parts from. The top ledges, frame rails, stabilizer bars, top and bottom connector plates are all resin. The pool wall is still made from metal as it’s responsible for holding everything together and in oval pools the buttress framework is always steel too. All resin pools are more expensive but definitely a very nice upgrade. Budget – This part is up to you, but by taking the above factors into account you should be able to figure out what you need and pick a pool that will serve you well. Of course we only touched on the pool itself and there are other components that make up the pool package. Filter size and type, ladder, step liner choice can all play a part in the final cost. For the average 24′ above ground pool kit complete with everything expect to pay between $2000- $3000 depending on features and equipment. When it comes to spending your hard earned cash on a new pool, buying from a pool dealer you can trust is paramount. I could write pages on ways pool dealers play the “gotcha” game by arranging and substituting various products to make their package seem like a bargain. Then you could go out and get bombarded with tons of information to sift through in your hunt for the best pool deal. But most people I talk to don’t care to know all that, they just want to know where they should go to buy a good pool. So I’m recommending you go to PoolsAboveGround.com to order you pool, pool liner or any pool accessories. They are an online pool store right here in Orlando and have been for many many years. They know above ground pools better than anyone, and they sell only American brand pools. We’ve been impressed with the pool packages as a whole, they have the right size filters, pumps etc. And maybe the best news is their pricing beats all the competition’s. Shipping is free and they deliver to your doorstep in just a few days. Last year we installed over two hundred of their pools and liners and think their packages are great. It’s refreshing to deal with a company that puts what works and what lasts over what sells or makes the most money. Sorry I couldn’t resist adding this pool to the page, I just love the looks of these real solid wood swimming pools. There’s not a lot to say other than how wonderfully cool they are. I heard them referred to as lawn furniture recently and thought the name seemed appropriate. Pressure treated wood just like that used in boat docks make for long lasting and stylish construction. This pool uses a beaded pool liner and the same equipment pack as all the other pool models. Super nice addition to any backyard if your wallet can withstand the hit. Think twice the price of the typical resin or saltwater pool. But then again even that’s a bargain compared to the price of the average inground pool!